As a kid, I remember eating things like Hamburger Helper (or Tuna Helper *cringe*) on the regular. This MSG, hydrolyzed corn protein, and enriched wheat with folic acid infused one-pan meal was a staple of the 80s and my friends and I would bemoan its existence over equally processed school lunches (obviously, I had not been taught my own food rules to cure picky eating at that point!). As the saying goes, “when you know better, you do better,” and I can honestly say I’ve never purchased a Hamburger Helper or any other variety. That said, I can understand the appeal! A meal that comes together in 20 minutes and only needs one pound of meat? Hamburger Helper certainly did have one thing right… the convenience! In fact, I’m sure its low price and extremely simple preparation were some of the major reasons it gained so much popularity (the taste… not so much!). With a few simple and equally inexpensive real-food ingredients, you can replace the pre-packaged one-pan meals with more nutritious options. 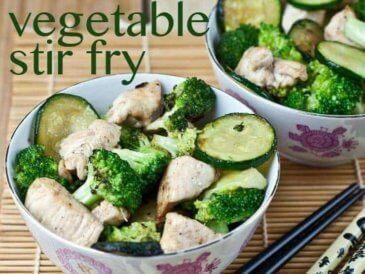 Certainly, you could use organic, gluten-free noodles or shirataki noodles, in place of the regular noodles in these types of one-pan meals, but this recipe is perfect for using various types of vegetable noodles. Another benefit to this recipe is how easy and fast it is to prepare. 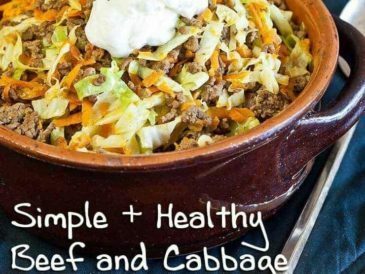 My kids love that they can help prepare this recipe (and the older kids can now prepare this all on their own without my help!). This simple stir fry is a regular in our meal planning rotation and is also my go-to for busy nights when I don’t have anything else ready to cook. 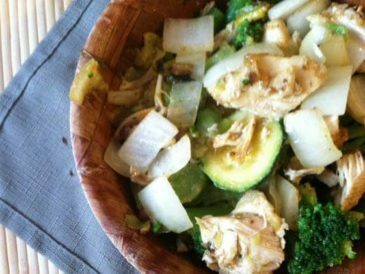 Zucchini is our favorite vegetable in this recipe but you can use any vegetable you have on hand. Some that readers have used and loved: carrots, yellow squash, kohlrabi, or sweet potatoes. 2 teaspoons cumin and 1 teaspoon of chili powder. Top with salsa, sour cream, and cheese for a Tex-Mex flavor. Add some Italian Seasoning and a can of diced tomatoes. Top with Parmesan for an Italian flair. Use curry powder in place of the spices listed and add a little coconut milk for a deep and earthy flavor. Try toasted sesame oil in place of the butter, add some extra garlic, and top with coconut aminos (similar to soy sauce) for an egg-roll like flavor. An easy stir fry that has a texture similar to pasta that kids love! 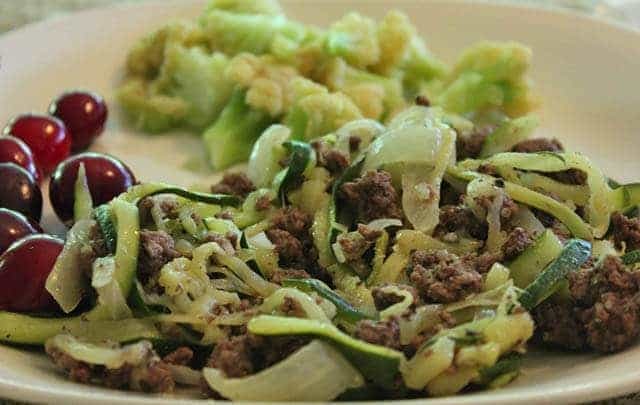 Use a spiralizer to make vegetables into fun noodles in this recipe. Thinly slice onions and use a spiralizer or peeler to make zucchini noodles. Add the sliced onion and zucchini to the skillet and saute until they are starting to soften. Remove vegetables from the skillet and place in a baking dish. Turn oven on to broil and place the baking dish under the broiler for about 7-10 minutes until vegetables are desired crispness. 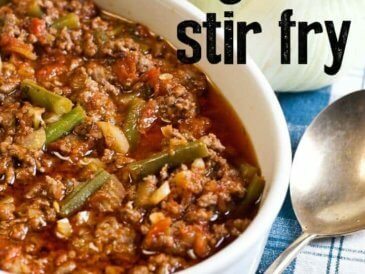 While cooking, brown the ground beef in the skillet and add the spices. Add the onions and zucchini back to the skillet, mix, and serve. Top with any desired toppings and enjoy! Use leftovers in an egg scramble for breakfast! 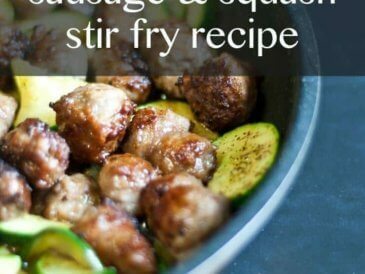 What is your favorite stir fry recipe? Share below!